The stone cross, which this cast reproduces, is carved with a depiction of the first Christian hermits, St Paul of Thebes and St Anthony the Great, receiving bread in the desert from a raven sent by God. Intricate decoration covers the slab. The original cross once stood in the churchyard at Nigg, Ross-shire, Scotland, but was moved indoors after storms damaged it in the 1720s. Plaster cast of a Pictish cross carved with a depiction of the first Christian hermits, St Paul of Thebes and St Anthony the Great, receiving bread in the desert from a raven sent by God. Intricate decoration also covers the slab. Cast of a pictish cross made in plaster in Edinburgh about 1894 and purchased from the Edinburgh Museum in 1894 for £10. The original was sculpted by an unknown artist in Scotland about 750-800 and once stood in the churchyard at Nigg, Ross-shire, Scotland, but was moved indoors after storms damaged it in the 1720s. Making plaster copies is a centuries-old tradition that reached the height of its popularity during the 19th century. The V&A's casts are of large-scale architectural and sculptural works as well as small scale, jewelled book covers and ivory plaques, these last known as fictile ivories. The Museum commissioned casts directly from makers and acquired others in exchange. Oronzio Lelli, of Florence was a key overseas supplier while, in London, Giovanni Franchi and Domenico Brucciani upheld a strong Italian tradition as highly-skilled mould-makers, or formatori. Some casts are highly accurate depictions of original works, whilst others are more selective, replicating the outer surface of the original work, rather than its whole structure. Like a photograph, they record the moment the cast was taken: alterations, repairs and the wear and tear of age are all reproduced in the copies. The plasters can also be re-worked, so that their appearance differs slightly from the original from which they were taken. To make a plaster cast, a negative mould has to be taken of the original object. The initial mould could be made from one of several ways. A flexible mould could be made by mixing wax with gutta-percha, a rubbery latex product taken from tropical trees. These two substances formed a mould that had a slightly elastic quality, so that it could easily be removed from the original object. Moulds were also made from gelatine, plaster or clay, and could then be used to create a plaster mould to use for casting. When mixed with water, plaster can be poured into a prepared mould, allowed to set, and can be removed to produce a finished solid form. The moulds are coated with a separating or paring agent to prevent the newly poured plaster sticking to them. The smooth liquid state and slight expansion while setting allowed the quick drying plaster to infill even the most intricate contours of a mould. Flatter, smaller objects in low relief usually require only one mould to cast the object. For more complex objects, with a raised surface, the mould would have to be made from a number of sections, known as piece-moulds. These pieces are held together in the so-called mother-mould, in order to create a mould of the whole object. Once the object has been cast from this mother-mould, the piece-moulds can be easily removed one by one, to create a cast of the three-dimensional object. Plaster cast of a Pictish cross made in Edinburgh about 1894. 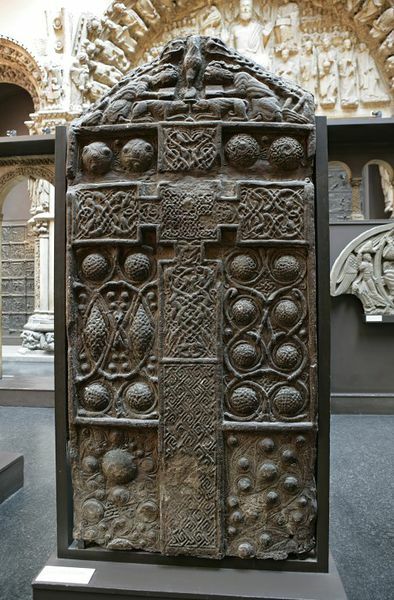 The original was from the churchyard at Nigg, Ross-shire, Scotland and made about 750-800 . 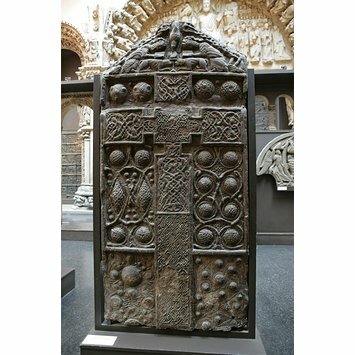 The Pictish grey sandstone cross from which this cast was taken is carved with representations of St Paul and St Anthony prostrate before the Host sent from Heaven, as well as other Christian and Pictish subjects. The original was once in the churchyard at Nigg, Ross-shire, Scotland, and has now been moved indoors. The cast was bought from the Edinburgh Museum in 1894 for £10.